How can I improve my own impact and effectiveness? How do I keep high performers in the company? Do I know what I need to know about my current people? Do they know? Are we hiring & promoting the right people? Have we NOT hired people who would have actually made us better? Could I use resources that would help me sleep better at night? How to improve? Where to begin? Looking for answers? See our BP Metrix™ Product Solutions & Pricing. At Bennett Partners we design and implement pragmatic solutions that can be executed in a meaningful time frame. We will work with you and your team to aggressively explore possibilities that take into account your organization's unique strengths and weaknesses. We lend the judgment of an impartial, informed, third party perspective. We are trained to select, administer and provide feedback via standardized assessment instruments. We are also aware of the power and the limitations of instruments. Working with you, we will determine if and when they are additive, providing analysis in terms of your context. 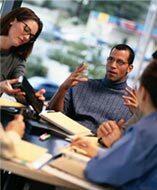 We integrate our doctoral-level training in psychology with a healthy dose of real-world common sense to address individual and organizational behavior, group dynamics, and business implications. In particular, we appreciate that appropriate survey selection, data interpretation, and focused implementation determine the ultimate value derived by our client. We apply our understanding of testing, assessment measures and metrics to tailor our approach to best meet your needs. Our team has breadth and depth of exposure with individuals and organizations at different stages of development and across varied industry sectors. We have learned the value of confident humility and candor. See Our Values & Culture. Customized surveys to give you the edge in hiring and retention. Our process leverages the value of customization, data-gathering, action-planning and perhaps most importantly: not making assumptions. We are committed to providing information and judgment to focus your efforts, to inform your decision-making, and to optimize your organizational impact. We engage you in dialogue to determine your context and objectives. When appropriate, we utilize focused, standardized assessments for metrics and descriptive information to inform our recommendations and interventions.